I see this objection way too often when I discuss supernaturalism. Here is the problem with this line of argumentation. Suppose a scientist mixes one gram of salt into a glass of water. A miracle occurs and the amount of salt in the water doubles. The scientist boils the water and finds out that two grams of salt remain. What will the scientist conclude from the experiment? Do you think he will conclude that a miracle occurred, or that, perhaps, he messed up the experiment and forgot to use de-ionized water? Since science is blind to supernatural processes, using science to argue against the supernatural is reasoning in a circle. Also, I would define a miracle not as a violation of the laws of physics but as an agent outside our universe (not created at the big bang) exercising causal impact on something in the universe. First of all, you're missing the important word in this line of argumentation: supernatural powers. ESP, telekinesis, psychic visions, teleportation. People claim to have these abilities, but when put into a controlled circumstance and asked to demonstrate them, not a single one has been able to do so. As far as your example, I imagine the scientist would assume the first time that he had done something wrong. If he performed the experiment a second time and the phenomenon occurred again, then he would be justified in discarding improper procedure as a reason. Though he still will not be immediately justified in labeling the event a "miracle," since as I've said before in comment threads on my blog, just because we don't know how doesn't mean we can't know how. And if it were a miracle, it would be a fantastically useless one. If science is blind to supernatural processes, why have your previous two posts attempted to include scientific evidence for supernatural propositions? You can't have it both ways. And by the way, science is not necessarily "blind" to supernatural powers or processes. If someone could demonstrate that they COULD read another person's mind with greater accuracy than could be attributed to random chance, then that would be a claim of supernatural powers confirmed by experiment. Likewise, if the prayers of one particular religion were answered with more frequency than any other, and more than could be statistically attributed to random chance, then that would be scientific confirmation of supernatural processes. But no such powers or processes have ever been observed, and the most likely explanation is that they do not occur. I think we can agree on the first point. Charlatans like Uri Geller, John Edward and Peter Popoff are intellectual poison and are renounced by Christians and atheists alike. It is fortunate that we have people like James Randi to shut them down. 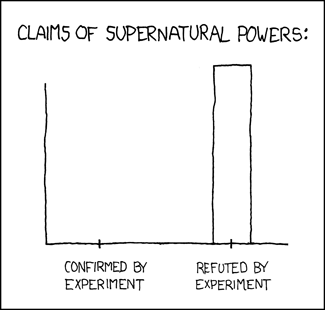 My complaint is that the use of "supernatural" and "confirmed by experiment" leads to a contradiction if the scientist is following methodological naturalism, a rule that does not apply to philosophers. A philosopher is perfectly allowed to take results from scientific research and draw supernatural conclusions form them. In 1979, two mental magicians, Banachek and Michael Edwards, managed to convince psionics researchers at Project Alpha that the two really had psychic powers. I do not dispute that the researchers thought they had a confirmed case of psychic powers. I do dispute that the researchers ever believed that the source was genuine supernatural intervention, rather than naturalistic brain wave activity. In regards to the saltwater thought experiment, I am not knocking science or scientists. If I had been the scientist performing the experiment, I would have been just as fooled by the event, and would never suspect a miracle. If the phenomenon occurred repeatedly, then I would chalk it up to something like the Mpemba effect. Even though the exact cause is unknown, the fact that it is measurable, testable, and most importantly, repeatable, leads me to conclude that the Mpemba effect is almost certainly the result of a natural process. In other words, I don't know what causes the Mpemba effect, but I am concluding that it is a naturalistic process. So "I don't know" = "I do know" kind of naturalism of the gaps. How exactly do you define something that is "supernatural"? If it is something immeasurable and imperceptible, then how can you possibly ever assert that it is occurring? If it is measurable and perceptible, then what makes it different from "natural" processes? Point of clarification, I should have said "unmeasurable," (that which cannot be measured because it is not tangible), not "immeasurable," (that which cannot be measured because its scale defies measurement). I see you've added your definition of "miracle" (which I am left to assume is, to you, synonymous with "supernatural process/event") to the original post: an agent outside our universe (not created at the big bang) exercising causal impact on something in the universe. Here's the problem with the reasoning, then. By postulating a "causal impact" you are saying that the actions of this agent have a demonstrable effect on this universe, and thus are scientifically observable and measurable. I suppose the argument you're making is that said causal agent, being outside of the universe, is not observable or measurable. In that case, based on what do you postulate that such a thing even exists? As you pointed out in my blog, we do not have the absolute knowledge that would be necessary to say that "X absolutely does not exist." You use this to defend the notion that an atheist cannot make a statement where X = God. Fair enough, I agree. But where you fall into the trap that you have ultimately set for yourself is when you make the statement that X = a naturalistic explanation. By saying that something MUST have a causal agent outside of the universe, simply because we know of no causal agent within it, is to fall into the same probabalistic fallacy you argued against. Even if you are not saying that it MUST, only that it is possible, based on what reasoning can you make that statement, particularly if there is by your own admission no way to know if such things actually do exist? Are you attempting to argue that merely because something is possible, it is therefore certainly true? I posted that we do not have the knowledge to conclude that God should not have created the universe in such a way as to allow evil. I never claimed that we lack the knowledge to investigate the claim whether or not God exists. My post here is neither a positive argument for supernaturalism nor an argument against naturalism. It is a rebuttal to a common objection to miracles. And yes, supernatural agents are undetectable unless they interact with the natural world. Such events would be observable and measurable, but not repeatable, as a miracle is an act of volition by an outside agent. You may ask "Why hasn't science detected such a thing?" It probably has, and the event would have been chalked up either as an anomoly or as an error on the scientist's part. That assumes you accept the underlying assumption, which is that a "supernatural agent" would have a hit-and-run personality. Also, the question remains: if not by the scientific method of observation, how do you determine whether something is a "miracle," or just an anomaly? And corollary to that, how do you know that there has ever been a miracle as opposed to just anomalies? If your answer is going to be "faith," then understand that I read that as "whatever I feel like believing." Which is fine if that's how you want to roll, but I personally want to believe as many true and as few false things as possible, which is most reliably achieved through repeatability and observation. If a "miracle" is unreliable or unpredictable, then it is actually indistinguishable from an "anomaly" regardless of its source, and essentially useless. Generally, it is reasonable to conclude a miracle when the event is unique, has meaningful significance, and lacks a naturalistic explanation that is not ad hoc. 1) The evidence for the occurrence of E is at least as good as it is for other acceptable but unusual events similarly distinct in time and space from the point of the inquiry. 2) An account of the natures and/or powers of the causally relevant natural agents, such that they could account for E, would be clumsily and ad hoc. 3) There is no evidence except the inexplicability of E for one or more natural agents which could produce E.
4) There is some justification for a supernatural explanation for E, independent of the inexplicability of E.